Magnificent Lakeside Lodge In Holly Lake Ranch - nur gelistet !! 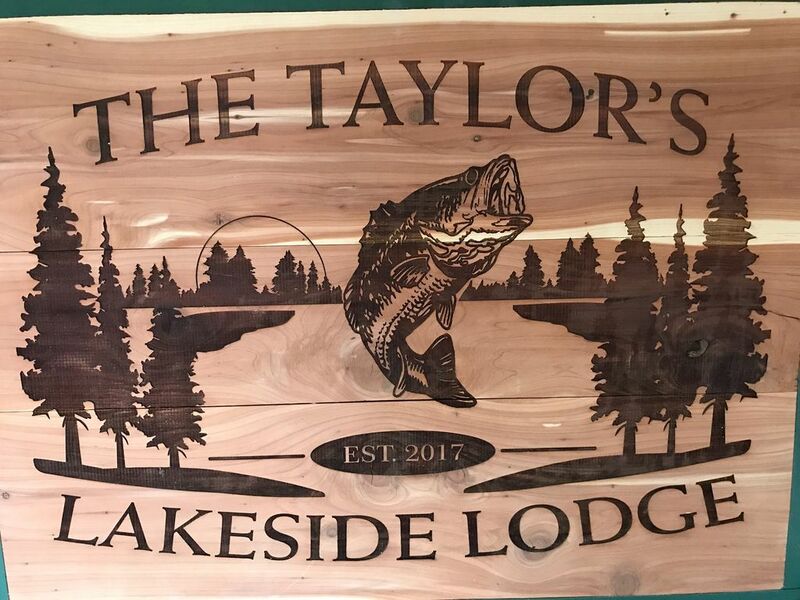 In den Pinienwäldern von East Texas und am See gelegen, bietet die Taylor's Lakeside Lodge alles! Perfekt für einen Familienausflug oder ein romantisches Wochenende. Gelegen in einem erstklassigen Wohngebiet - Holly Lake Ranch - genießen Sie Annehmlichkeiten wie Schwimmen während der Badesaison, Whirlpools, Angeln, Tennis, Kanufahren, Golfen, Wandern, Putten, Pickel und vieles mehr. Das Resort verfügt über ein Freizeitzentrum mit einem Spielzimmer, einem Mini-Theater und 2 Restaurants. Dieses exquisite, komplett eingerichtete Haus wurde gerade komplett renoviert. Mit 4 Schlafzimmern und einem Loft-Schlafzimmer bietet dieses Ferienhaus Platz für bis zu 20 Personen. Sie können wählen, sich im geräumigen Wohnzimmer zu versammeln, auf einem der 3 Decks zu sitzen, um einen Blick auf den Sonnenuntergang zu genießen oder zu grillen, vom privaten Steg zu angeln oder um die Feuerstelle herumzusitzen und S'mores zu machen. Wir haben sogar ein Paddelboot und ein Kanu für Sie bereit! Das Master-Schlafzimmer mit einem Master-Bad verfügt über ein Queen-Memory-Foam-Bett und mit Blick auf den See. Schlafzimmer Nummer 2 verfügt über ein luxuriöses Queen-Memory-Foam-Bett. Schlafzimmer Nummer 3 mit Blick auf den See und verfügt über ein Queen-Memory-Foam-Bett. Im Erdgeschoss befindet sich ein großes 4. Schlafzimmer mit Blick auf den See und verfügt über 2 Einzelbetten mit Ausziehbett und ein großes Bett, das 6 Gäste schlafen lässt. Im Obergeschoss befinden sich 4 extra große Einzelbetten und eine Ausziehliege, auf der weitere 5 Personen schlafen können. Das Wohnzimmer verfügt über 2 Schlafliegen sowie eine gemütliche Schlafcouch. Es gibt zwei zusätzliche Doppelmatratzen zum Schlafen. Wir hoffen, dass Ihre Familie die Gelegenheit bekommt, dieses erstklassige Resort zu besuchen und alles zu genießen, was es und die Taylors Lakeside Lodge zu bieten hat! Bitte werfen Sie einen Blick auf unsere anderen Eigenschaften - The Taylor's Frieden der Kiefern und The Taylor's Whispering Pines. We were celebrating the memory and birthday of our grandmother/mother. The lake house was really nice and comfortable. There was enough space for everyone. Was a bit disappointed in not having a secure wi-fi connection, however, it provided an opportunity for us to disconnect and enjoy quality time with each other. The grill wasn't clean when we arrived, but the tools necessary for cleaning were on hand, so we were able to fix that. We were able to get out on the lake, take nice nature walks, fish (although there were none to be seen), make s'mores at the firepit and sit around it and talk. Overall wonderful experience! It was a beautiful place and the house was so nice . We did a cousin retreat at this property. There was ample room, the view was amazing and the weather was good enough that we were able to take advantage of the outdoor seating on the balconies, the fire pit, and the deck on the lake. It truly is an amazing place. And....if I could have somehow taken that bed and attached it to my vehicle to bring it home with me I would have. That bed was amazing. My family had our Christmas at this cabin. Plenty of room for 6 adults and 11 kids. We went in January, but they still had the Christmas tree and decorations up, which was a nice surprise! We enjoyed using the canoe that's provided. The kids loved the foosball table. The kitchen was a nice size, but could use a few more basic cooking items - like sharp knives and a nice cookie sheet. We couldn't find a lighter for the fire outside, so ran to the store to get one. Also had to get more toilet paper. Overall we thoroughly enjoyed our stay and hope to come back! Nice, big, spacious cabin for large groups or families. Very clean. Simply and beautifully decorated. The owner Lenora was great to respond promptly to our texts. The location was amazing! Beautiful wooded area by the lake. There were 9 adults and with our little kids, ages 9 months, 2 years old, 4 year olds(2) and 5 years old, it was helpful to have the facilities on the other side of the lake. There were 2 playgrounds, a tennis court, a pickle ball court, paved pathways that the kids could ride their little bikes on. The paddle boat and canoe at the home were fun to use. We were fortunate that it did not rain and the temperatures were in the mid-high 60's mostly. The home was clean and nicely and simply decorated. We were worried about the stairs going to the lowest level because it did not have a banister/railing. We were afraid that our little kids would fall off the stairs. Luckily none of them did. I would say it is a 4 bedroom home with a loft, not a 5 bedroom home. The person that sleeps in the loft does not have much privacy and they could hear in the middle of the night the babies and little kids crying. The kitchen did not have a 13 x 9 pan to cook in and we did run out of toilet paper. So we were glad that the grocery store Brookshires was nearby so we could pick up some things that we needed. We did not know ahead of time but were glad to find out that there is a Pack and Play crib for one of the babies. A bit of an inconvenience was that whenever we left the property, say, to go to the grocery store or out to a restaurant, we could not get back in to the gated community where the home is until we drove to the Holiday Inn Resort across the street to get a token to put in the slot to open the gate to get back in. Sometimes we had to wait in a line of cars to get the token from the security station. The security station seemed to be open 24 hours but I'm not sure.